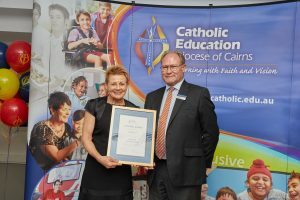 Mrs Ida Pinese – Principal of St Stephen’s Catholic College, has recently earned an outstanding accolade, which recognised her commitment to Catholic Education. Mrs Pinese was awarded the Leadership Docemus Award as part of the 2017 Catholic Education Week. Mrs Pinese is an outstanding Leader and Principal. Her professionalism and tenacious spirit of excellence has directly contributed to the growth of St Stephen’s from a small rural college to one which punches far above its weight in all aspects of school life. As the college has grown, Mrs Pinese has ensured that it has retained a focus on the importance of being a family and maintaining an active part of the community. Mrs Pinese clearly articulates the school vision and expectations to all staff, students and families in a manner, which motivates and calls people to action. She models the Gospel values in her relationships with all and is a great listener who always makes time to listen in a non-judgmental manner. She takes times to speak to families, understands each family’s circumstances including family pressures or financial concerns and she discreetly does what she can to assist. She thanks people, is humble, welcoming and compassionate. At the end of school terms, she hand-writes an individual message to each staff member. When students achieve in any aspect of life such as academic, music, sport or cultural achievements, Mrs Pinese will write the student a card to congratulate them and then she goes to find them to deliver it. She phones parents of Year 12 students to congratulate them on their child’s achievements. She shows a great interest in the development of students as ‘whole people’ and attends college camps and retreats. Mrs Pinese actually runs the school cross country with the students, attends extra-curricular events such as Lions Youth of the Year and Relay for Life, and she also teaches a class. As a leader, Mrs Pinese always leads by example. One of her mantras is “the standard you walk past is the standard you accept”. She ensures that each day, particularly at lunch times, she walks around the college and engages with students and staff. She picks up litter and takes classes at short notice, as she does not expect others to do something that she would not do herself. Extraordinary leaders like Mrs Pinese are always professional and value the importance of demonstrating attention to detail. She gives others the autonomy to do their job and she builds leadership capacity within the school community. As a lifelong learner, she continually engages in self-reflection and professional renewal. Mrs Pinese is an unpretentious, inspirational, caring Principal and person.